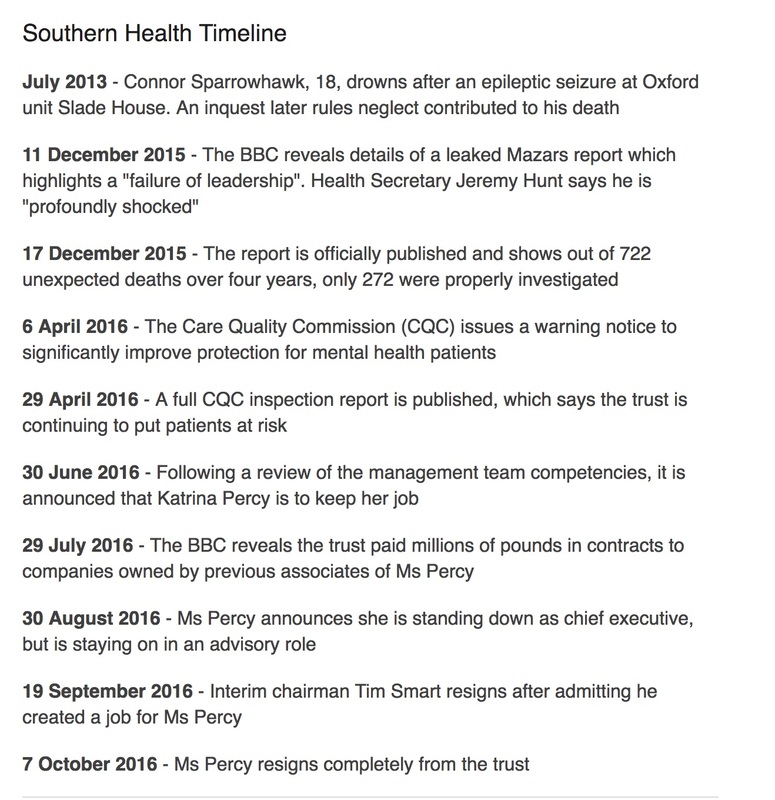 The failings drag back to 2011 when the Trust gained Foundation Trust status, and have been well documented since then. A shedload of public dosh has also been spent on repeatedly reviewing the Trust governance. Simply shameful. Here’s hoping some of the remaining execs follow suit sharpish. In other news, the National Quality Board guidance, an outcome of the CQC Deaths Review, was published yesterday. More guidance. Drenched in typical ‘guidance’ statements like; To ensure objectivity, case record reviews should wherever possible be conducted by clinicians other than those directly involved in the care of the deceased. I should start walking more again and give up booze and chocolate. We should keep the house cleaner. Of course case record reviews shouldn’t include the involved clinician. Seriously. Is this how far we’ve come? You couldn’t make it up really. Just words. Put together in a report like shape. Same old words, same old order. Like browning blossom falling onto the damp ground below. Soon to disappear and be forgotten about until the following spring when new versions of the same appear. With some agitation by various people, including George Julian and Neil Churchill of NHS England, families were eventually allowed to attend this day which is organised as a typical NHS exercise in heartsink pomp and ceremony. Swerving the opportunity for a humane, passionate, critical, efficient, collective and effective response to a scandal that obviously demands alternative and innovative responses, the same old turgid suspects are lined up to talk the same old, same old talk. Durkin, Richards, Mackey, Hunt and more Durkin. The 7.5 hour gig includes 10 minutes of a family member, an hour of scheduled discussion and 20 mins of Q&A. We could probably write the script of the day now and save £££s. Not only in the laying on of the event but the time taken out of attendees’ everyday lives. I feel so sad that the brilliant and groundbreaking work of the Mazars team is being dragged down into this well trodden, hierarchical, tedious and mediocre NHS furrow. There was a moment, back at the end of 2015, early 2016, when actual change seemed possible. Instead, it’s business as usual and a shedload more shoulds. Postscript: Had a timely reminder via Twitter as I pressed publish that we have held the Sloven board to account (a CEO, 3 Board Chairs and 5 NEDs so far.) Yep. We bloody well did. Cracking work #JusticeforLB and continued drops of brilliance. Thanks for the enlightenment Sara. And there was my new friend, a fellow long suffering next of kin and myself almost believing that at last we were being respected by the NHS, NHS England, the Dept of Health and CQC all the way up to Government when in fact the answer to that short lived fantasy was in the hurried last minute invites. Accountability, Candour and Transparency? They failed at the first hurdle before their promised new wave of sincerity even begins. Still as insensitive and arrogant with a wholesale disregard to families. Even worse, an ongoing silent contempt to our family members with a learning disability who had their lives taken away. As usual not a word out of place. And every sentence full of insight. Brilliant Analysis. You I mean not the guidance itself! I attended the HSIB family consultation day and the CQCDeathsReview family consultation day, and interestingly (maybe not the right word) the consensus of all families was the KNOWING dishonesty of Trusts. 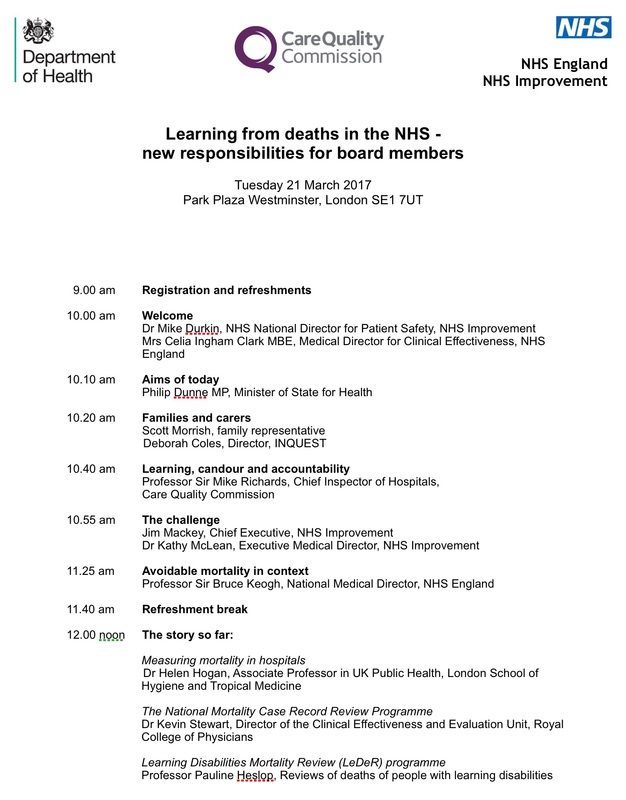 This issue is not addressed by the the CQCDeathsReview. 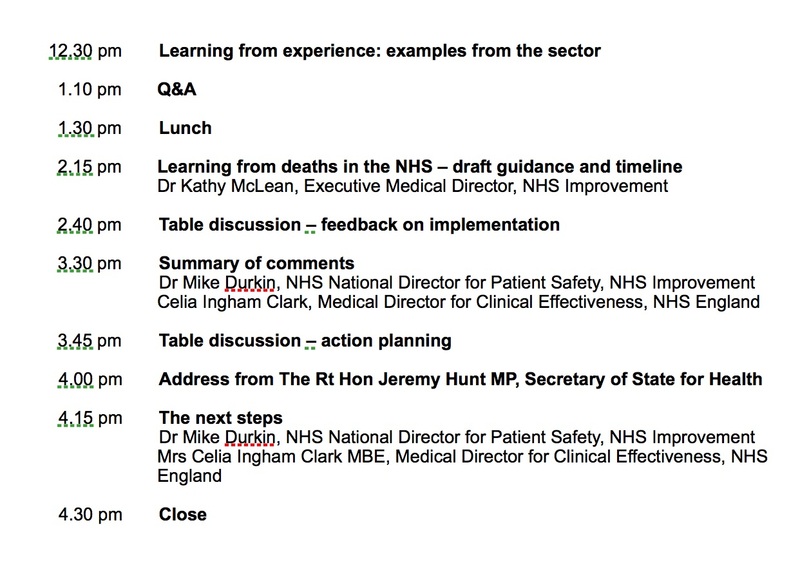 In fact, at the CQCDeathsReview family consultation day, we all signed a petition I drew up, asking that Investigations are signed off by the Medical Director and include a ‘statement of truth’ and ‘no omission’ and that any false or misleading information would be subject to criminal sanction under the Duty of Candour. Frankly otherwise they are not worth the paper they are written on and simply contain any old rubbish. – Medical Professionals should be trusted and shouldn’t have to be subject to committing to the Truth. – Also when the same point was made at the HSIB family consultation day, it was overheard said ‘we’ll have to run that one by the lawyers’ ! We was (intentional colloquialism) all taught in school to be honest and respect and trust our betters. Nope in 21st Century England’s NHS, do that at your peril. I’m not saying that many Doctors are out to intentionally harm patients, but many Trust’s are out to intentionally hide harm to patients. Unfortunately, it’s every man woman and child for themselves. It still appears the status quo of regulation without enforcement is persisting. P.S. Don’t see much mention of the words Coronal Law or Civil and Criminal Law in the Guidance. Why are they called Trusts, if they can’t be trusted. They too make huge mistakes – then drag families through years of misery and fatigue. They string out investigations, for first must be by the manager of the team responsible for the complaint..They can ignore communications for ages…it appears..for as long as possible ? Family will be left in anxiety to appeal to first this deaf LA team, then LA complaints process – while at same time left to anticipate then put out crises fires, in the very lengthy interim. Although exhausted and eventually ill, the families are then forced to go to Ombudsman who can take months or years to investigate,(especially in Grammar School areas with gazillions of education appeals) and Adult care appeals can appear to fall into a big hole. Recent LA fostering case – this LA has now reluctantly admitted their huge mistakes in process – that it took family six years to expose. Leaving the young person involved and the appealing family, living a miserable exhausted limbo. Family was rewarded a few hundred pounds by Ombudsman – for the misery imposed on their young relative, and 6 years of their life. What impact on LA …who can just walk on. For Ombudsman will not comment or make recommendation on HR issues. Family stated on TV the other day – that LA has still not met or apologised to them..
not having families invited , no one taking the time to think about the appropriateness of making immediate invitations says it all. Late invitations and those made after pressure of any kind has been applied from any quarter are tainted with a lack of sincerity. Nothing about the ‘event ‘ suggests a commitment to equal partnership with partners/carers and families. No depth of feeling went into the planning and it shows. Something more meaningful and inclusive, in addition, needs to take place. They believe their account is settled by telling us to …..’just move on’. For if we don’t..we might just get angry. And that is justt not on. We are not permitted our anger. We should just get over ‘it’ no matter how huge the injustice or damage..done. Believe and expect a us not to feel, or express the pain and injustice or ever increasing anger when they treat us as…and call us…. ”f’ing pest” (s). just get angry…and that… ”chaps…. is just not on”……….